PT Honda Prospect Motor - Honda Indonesia or known as "HPM" is a reputable foreign capital investment company in Indonesia, running business in automotive industry. Honda Indonesia operates primarily as the brand holder of Honda automobiles in Indonesia. Honda Indonesia is a sole agent and assembler of Honda automobiles and components. According to information found in Honda Indonesia's website as cited by JobsCDC.com, PT Honda Prospect Motor is a multinational joint venture company between Japan's Honda Motor Co Ltd and Indonesian PT Prospect Motor. At present, PT Honda Prospect Motor is 51% owned by Honda Motor Co Ltd and 49% by PT Prospect Motor. Honda Indonesia is widely known nationwide as one of the largest car manufacturers in Indonesia. Honda Indonesia has a total installed production capacity of 200,000 units per year. 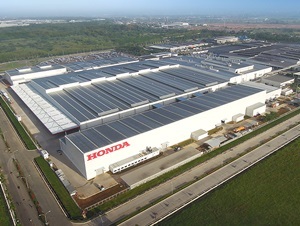 Honda Indonesia is based in Jakarta and now has 2 factories in Karawang West Java. Honda Indonesia's head office is located at Jl Gaya Motor I Sunter II, Jakarta 14330. At present, Honda Indonesia has 5 affiliated companies; PT Mitsuba Indonesia, PT Honda Lock Indonesia, PT Indonesia NS, PT Toyo Denso Indonesia, and PT Indonesia Stanley Electric. S1 Mechanical Engineering, Electrical Engineering. S1 Industrial Engineering, Mechanical Engineering, Electrical Engineering, Automotive Engineering, Physics Engineering. Deeply interesting in automotive industry (automobile). Preferably have driving skill and possess driving license class A (SIM A). S1 Industrial Engineering, Industrial Statistics. S1 Law, Human Resources Management Psychology. Able to make planning and process the data comprehensively. JobsCDC.com now available on android device. Download now on Google Play here. Please be aware of recruitment fraud. The entire stage of this selection process is free of charge. PT Honda Prospect Motor - Fresh Graduate Staff Honda Indonesia July 2018 will never ask for fees or upfront payments for any purposes during the recruitment process such as transportation and accommodation.